Where are the best gay-friendly regions in New York? Manhattanite Mike Todd, publisher of Get Out! Magazine – NYC's leading guide for LGBT nightlife and entertainment (along with celebrity and personality pieces) – gives his advice on gay-friendly travel to NYC. NYC is a melting pot in the gay bar world, where each neighborhood has its own look, distinction, and vibe. There is a neighborhood for everyone to fall in love with, like Hell’s Kitchen, where you have the modern updated industrial look and also the most gay bars of any one neighborhood in NYC. A couple of the classier options include Therapy and Industry, and they are good to start the night off with a few drinks, while the more experienced favorites would be Posh, Barrage, and The Ritz. If you’re looking for that West Village vibe, then visit 9th Ave Saloon, Atlas Social Club, and DBL/Dive Bar Lounge. Then there are newer Hell's Kitchen venues such as Hardware, Fairytail Lounge, Boxers NYC, and Shadow Boxers (the latter two are both gay sports bars), plus an up-and-coming trendy bar for country music fans and their admirers: Flaming Saddles. Room 53 is a beer and wine bar with a piano and food. Also be sure to check out the newer dance clubs, Stage 48 and XL. All of these venues have strong staying power. Outside Hell’s Kitchen, the West Village hosts some of the oldest gay bars in Manhattan, let alone the country, all within walking distance. You have The Monster, the world-renowned Stonewall Inn with both a bar and club inside, as well as some smaller venues such as the Levi/leather/bear venue Ty’s Bar on Christopher Street. Boots & Saddle is a newer venue in the West Village with more than 21 drag shows a week. They also serve brunch on the weekends and munchies all week long. Other bars with staying power in the West Village include Pieces, Julius, RockBar, The Hangar, Cubbyhole, Marie’s Crisis, and The Duplex. Chelsea, which not too long ago was one of the city’s most popular "gayborhoods," has been hit with huge rent hikes, but there remain some places to love. Make sure you check out popular favorites including Eagle NYC, GYM Sportsbar, and Barracuda. On the East Side you have some popular bars, as well, including Uncle Charlie’s piano bar, Evolve Bar, The Toolbox, and the hugely popular Townhouse Bar. One trend is mixology. Trendsetters are increasingly looking for complex cocktails and wanting new flavors, while the older classics and pre-mixed frozen drinks hold less fascination than they once did. Social media is also playing a key factor in the nightlife industry as more interactive social media monitors and big-screen TVs are placed around the venues, so customers can stay longer without missing out on the latest news and gossip. USB connections and charging outlets for personal electronics are installed in venues around the city, so no one has to worry about dead batteries anymore. Music videos are making a comeback as they play on big screens, and even sporting events are becoming staples of the city’s bars. Male go-go dancing is trending more now than ever before, too. More than half the venues in the city have go-go dancing on a nightly basis. I think Magic Mike, the movie, has had an influence on the nightlife scene with both men and women coming out in droves to experience and pay attention to male dancing at its best. The nightclub scene that we once knew is no longer. Now the trend is to have weekly parties or events at venues around the city. Clubs are finding it harder to operate on a seven-day schedule with the ever-rising rents, operating expenses, and wages for staff and security, especially in the largest venues. The city has made it even more difficult in many ways, making it hard to compete, by providing a constant flow of high-priced fines to many of the nightlife venues, as well as "no parking" signs through the overnight hours in areas such as Chelsea. While NYC has always been known for the 24-hour lifestyle as "the party city of the world," that reputation is fading somewhat and has slowly taken a toll on our tourist industry. For those reasons, more and more tourists are heading to other major cities around the globe to experience the nightlife industry with many choices of parties, which NYC had always been known for. But New York is resilient, and we still have a thriving LGBT nightlife scene despite some of the hurdles for some. There are dozens and dozens of bars, clubs, spas, and other LGBT-friendly venues in New York catering to all types of people. 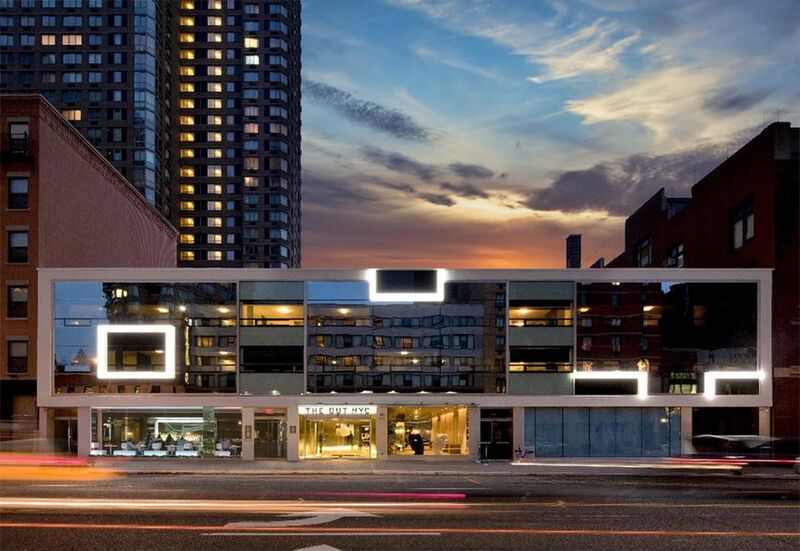 The OUT NYC Hotel at 510 42nd Street (near Times Square in Hell’s Kitchen) would be the hotel of choice for the gay traveler. It’s a gay complex with a hotel, lounge, nightclub, spa, and KTCHN, a restaurant for casual to fine dining.